What the Koran Really Says is a collection of papers representing critical assessments of the Koran in a variety of areas – Introduction; Background; A Question of Language; Sources of the Koran: Essenian, Christian, Coptic; Suras, Suras, Suras; Emendations, Interpolations; Richard Bell: Introduction and Commentary; Poetry and the Koran; and Manuscripts. This is definitely a volume for the specialist – someone with a pretty extensive background in the subject and a grasp of Arabic (and Semitic languages in general). None of which I have in any great abundance. Which is not to say that there aren’t articles here of interest to the generalist. Many, however, assume a breadth of knowledge the average reader will not have. Thus I wandered, lost, in many articles (e.g., the paleographic treatise “The Problem of Dating the Early Qur’ans”). For the uninitiated there were some fascinating papers, though. Warraq’s introduction, for example, offers an overview of Koranic studies since the middle of the 19th century; and shows how, despite the claims of the faithful, the Koran is anything but the “clear” (mubin) Word of God. Not only is it unclear now whether the Arabic it’s written in was ever actually spoken but, like its rival Christian and Jewish scriptures, it’s replete with obscure and confusing text. A circumstance even its earliest, Muslim commentators wrestled with. Franz Rosenthal’s “Some Minor Problems in the Qur’an” struggles with problems of interpretation in some very important suras – primarily Sura 9, which lays the basis for collecting the jizya, the tax levied against the People of the Book. The phrase an yadin, which occurs in the verse, resists adequate translation and even its meaning in the Arabic has stumped commentators for centuries. The following paper, Claude Cahen’s “Koran X.29,” suggests that it refers to a rite of submission but admits that there’s no textual or anthropological evidence for it. As I learned, many scholars have come to the conclusion that many of our problems stem from the fact that the suras’ original contexts were long since forgotten by the time the first commentaries were written. James Bellamy’s “Some Proposed Emendations to the Text of the Koran” questions the fanatical resistance to changing any word in the received text, even when an error is obvious. 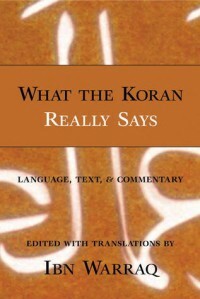 Bellamy quotes Uthman (the third caliph), who, when he noted mistakes in the text, said, “Don’t correct them for the Bedouin Arabs will correct them with their tongues.” Bellamy argues that this intransigence does a disservice to the text and to believers’ understanding of their religion as it has forced subsequent commentators to do linguistic somersaults and concoct far-fetched explanations for nonsensical passages. Passages which become perfectly clear and meaningful when one realizes that a copyist forgot a stroke or added one too many. It’s of interest to compare this attitude with Christians’ and Jews’ attitudes toward their respective scriptures. By and large, Christians and Jews have actively sought the best reading of their Bibles; in fact, there’s a cottage industry that aggressively scours various editions and translations. It will be interesting to see if a similar spirit takes root in Muslim scholarship. The final half of Ibn Rawandi’s essay “On Pre-Islamic Christian Strophic Poetical Texts in the Koran: A Critical Look at the Work of Gunter Luling” brings up the recent spate of revisionist histories (mainly Western in origin, I gather) that argue against the traditional story of Islam’s origins. Some of the more radical notions include the idea that Islam arose in northern Arabia, in towns bordering the Roman and Persian empires, between AD 650 and 800; that “rasul Muhammad” was a title and no one man named Muhammad ever lived; or that Islam is an offshoot of a heretical Christian sect (or a Jewish one). Fascinating stuff, though I can see how even a moderate, believing Muslim might become uncomfortable with the fundamental questions being asked (it’s akin to a Christian reading about how Jesus Christ never existed and Paul invented Christianity – yes, the theory’s out there). But as the author quotes Pascal – “There is always enough evidence for those who want to believe, and never enough for those who do not.” In my opinion, as long as questions are posed in the respectful, scholarly atmosphere of these papers, it shouldn’t cause offense. After all, it’s the message, not the medium that matters, whether the Word came from a south Arabian trader, a Jewish rabbi, the Son of God, or some other prophet. But I wax too philosophical for a simple book review. Weighing in at 744 pages of text and due to its specialized audience, I can’t really recommend this to anyone though the notes and bibliographies might be mined for further study.